Join the QuiltWorks community. We have a variety of opportunities for you. Call or come by to find how you can help. Sew tops, use our long arm machine to quilt, bind quilts. You can make quilts at QuiltWorks using our machines or make quilts at home - whatever works for you! Help keep track of quilts as they move through the assembly process and are delivered to local organizations. 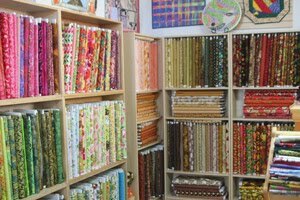 Volunteer for a shift at our retail store, ThriftStitch, which helps fund QuiltWorks by selling affordable quilting fabric.